One of the most trusted SEO companies, PageTraffic, has been experiencing rapid growth as well as significant expansion of client le base. PageTraffic intends to forward the same high quality service that it is known for to its new as well as existing clients. Growing staff, bigger office and a new improved site are a matter of natural progression. "We are looking to strengthen our already significant presence in USA. Client satisfaction has always remained on the top of the charts for us. With our new office we will be able to cater better to our fast expanding client le," says PageTraffic CEO Navneet Kaushal. "We also have plans to expand and solidify our client le in Europe. The recent expansion in capacity and addition of SEO experts enables us to do exactly that." 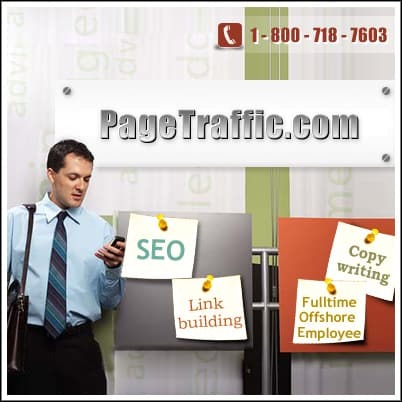 PageTraffic has added more expert professionals to its arsenal recently. These professionals add to the widely trusted expertise of the company. This also implies an improvement in the clients per professional ratio of the company, thereby ensuring better service to each client. The move to a bigger office in Chicago has resulted in more space for the sales staff in turn facilitating greater collaboration and possibilities for continuing expansion. The company is expanding on the current facilities, such as conference rooms, recreational spaces and project management areas. The recent expansion in terms of both people and space results in heightened capacity and improved service to the clients. PageTraffic has taken significant strides in improving usability and enhancing user experience by launching its new website. It is designed basing on the latest usability studies and client feedback. Lately there have been many changes in the way sites are designed. There have been significant developments in usability, intuitiveness and user profiling. Our new site has been developed basing around these concepts. "The site has been divided into sections depending on the client profile, so that we can serve to each client's requirements perfectly. Site navigation is based on user intuitiveness and the whole site is totally integrated," says Navneet Kaushal. The persuasive content on the new site has been subject of much attention. It not only explains the complex SEO concepts lucidly but it is surprisingly lyrical too. This is like a whiff of fresh air in the jargon filled world of search engine optimization. The highlights and the textual links render the content easy to scan. In fact, persuasive copywriting has been offered as one of the new services by PageTraffic. The copy writers are trained in the art of persuasive copywriting elaborately. The images on each page of the site summarize the idea aptly and help break the monotony that average web pages are ridden with. The colors of the site are soothing and navigation friendly. The top panel labeled as What's Next? on the right hand side of each service pages provide all the necessary details, for example, the clients list, testimonials and case studies, that a client might look for before taking a decision. "The new site is a product of much research in terms of navigation and usability. We have provided all the relevant information at all the right places so that the user does not have to visit too many pages. Because the end goal is not to keep the visitor on the site for a longer period but to enable him with the right information and making his task easier," says PageTraffic's usability expert Mike Jones. PageTraffic founded in 1999 is a premier search engine optimization company with head office in New Delhi and sales office in Chicago. Trusted for result-oriented and effective SEO services, PageTraffic provides search engine optimization, link building and persuasive SEO copywriting services. PageTraffic is also known for its unique full time offshore consultants offerings under which consultant works offshore 40 hrs a week exclusively for a client. The company has above 800 satisfied clients from all over the world.